Mickey's Christmas Carol is a twenty-four minute animated short film produced by Walt Disney Productions and originally released in the United Kingdom on October 20, 1983 by Buena Vista Distribution. The film was released in the United States on December 16, 1983 as an accompaniment to a re-release of The Rescuers. It is an adaptation of the Charles Dickens classic A Christmas Carol, featuring Scrooge McDuck as his namesake and inspiration Ebenezer Scrooge and Mickey Mouse as Bob Cratchit. This film was based on a 1972 audio musical entitled Disney's A Christmas Carol. 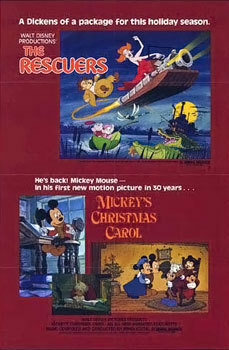 Mickey's Christmas Carol was the first new Mickey Mouse cartoon made in 30 years after The Simple Things. It was also broadcast on TV on NBC from 1984-1990, CBS from 1991-1998, and ABC in 2000 and 2003. On December 10, 2008, it was shown on ABC Family (along with Winnie the Pooh and Christmas Too) as part of their "25 Days of Christmas", but with several abrupt edits. It also premiered on Toon Disney (now Disney XD) in that same year. The short is also featured, without its opening credits, in the direct-to-home release, Mickey's Magical Christmas: Snowed in at the House of Mouse. It is also available on the ninth volume of the Walt Disney Classic Cartoon Favorites DVD collection, as well as in the Walt Disney Treasures set Mickey Mouse in Living Color - Volume 2; however, the latter is the only DVD release to retain the film's widescreen aspect ratio. The aforementioned broadcasts in the 1980s and early '90s spanned a full hour, with the first half consisting of the following older cartoon shorts: Donald's Snow Fight, Pluto's Christmas Tree, and The Art of Skiing. Each of the four items in the program was preceded by a narrative wraparound segment in which one of the Disney cartoon characters (Donald, Pluto (with Mickey translating), Goofy, and Mickey, respectively) would talk about his favorite Christmas, thus leading into the cartoon in question. From 1993 onwards, The Art of Skiing was excluded from the annual broadcast, replaced at the end of the hour by one segment or another. The 1993 telecast, for example, featured a behind-the-scenes featurette on The Nightmare Before Christmas. Later broadcasts simply reduced the timeslot to half an hour, showing Mickey's Christmas Carol by itself.